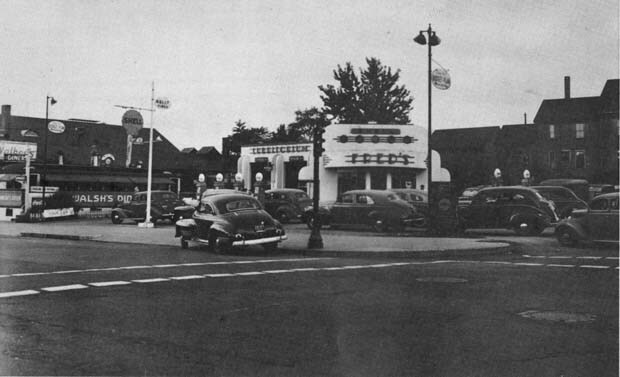 "Motorists converged on Fred's Service Station at the corner of Main and West Water Streets one day before a gasoline rationing plan went into effect. As part of the War Price and Rationing Board's rationing plan, motorists were required to register for rationing coupon books on July 9, 10 and 11 at two locations: the Greenwood School and the Wakefield High School gymnasium. Registrations were conducted by school teachers. As part of the plan, every registrant received an 'A' book of coupons consisting of 48 coupons (each good for four gallons) on six pages. Each page was to last two months. This would allow an average of four gallons a week, or 16 gallons per month, based on 240 miles of driving each month. Additional rationing coupons were available for business needs, although these were only given out after 'considerable study and exacting data' was presented. Neighbors were required to participate in a 'share-the-car' program, a prerequisite for eligibility for extra rations. Only those people with irregular or unusual hours of work, no fixed place of work, or those who could not find passengers were exempt. The applicant had to list the number of people to be carried in connection with their work, the mileage for the previous 30 days, and the average monthly mileage for the first three months of the rationing period. Additional rationing books included 'B' - an extra 64 gallons in 12 weeks; 'C' - an extra 384 gallons for 3 months; 'S-1' for commercial vehicles and small trucks - an extra 480 gallons for four months; 'S-2' for large trucks - an extra 1920 for four months; and 'D' for motorcycles - with a unit value of 1.5 gallons. The gasoline rationing regulations gave local boards the power to rule a motorist off the road by refusing to give the necessary coupons to purchase the gasoline. Anyone who submitted false information on applications for supplementary gasoline rationing cards were subjected to a $10,000 fine or one year's imprisonment. Neighbors and co-workers were also encouraged to report to the local rationing board anyone they suspected to be in violation of the regulations." -- Text from calendar by Jayne M. D'Onofrio. “Gasoline rationing in Wakefield, July 21, 1942,” NOBLE Digital Heritage, accessed April 20, 2019, https://digitalheritage.noblenet.org/noble/items/show/6952.